extremely easy chocolate peanut butter pumpkin bars. pumpkin spice syrup. homemade roasted pumpkin puree (for pies and such). pumpkin cheesecake with ginger browned butter crust. pumpkin pie ice cream. pumpkin pie spiced granola. spicy + sweet roasted pumpkin seeds. pumpkin tiramisu. brown sugar pumpkin pie. Ahhh pumpkin season. You are fully upon us and I love it! I can't wait to dive right in and make ALL THE PUMPKIN THINGS. Are you with me? Here's 9 delicious ideas to get you in the mood! Okay, yes. All of these. 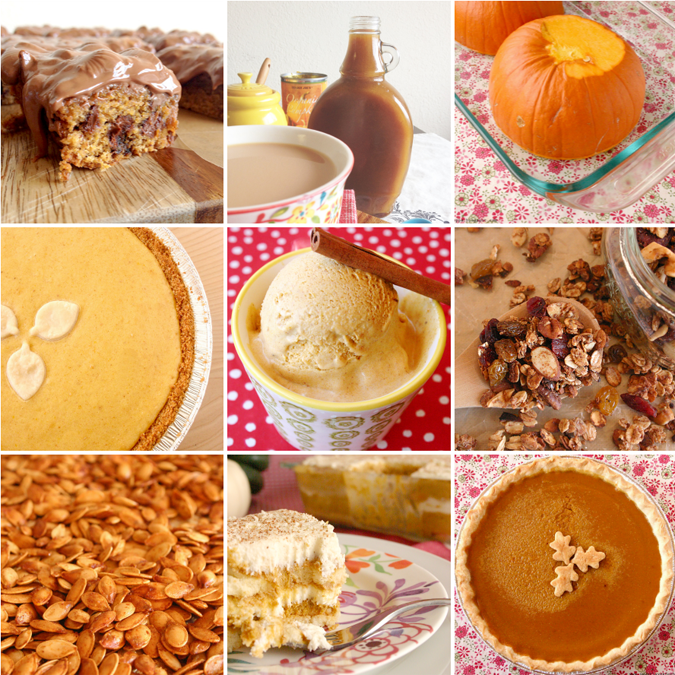 This is the first year I made recipes using pumpkin and I am savoring every minute of it! These all look great as well! I am really quite excited about all of these recipes. So hope you're able to try a few! LOVE pumpkin and will be Pinning this for later! I'm so going to make those chocolate peanut butter pumpkin bars this year! Mouth watering! I need some toppers in this theme to go on cupcakes I am making for my moms 80th surprise party, can I order just the toppers or is there a printable for it? I really just needed the pictures, well actually that's not even true, i'm already in the mood for FALL!!!! (0: But I am so thankful for the links!! I can't wait for FALL!